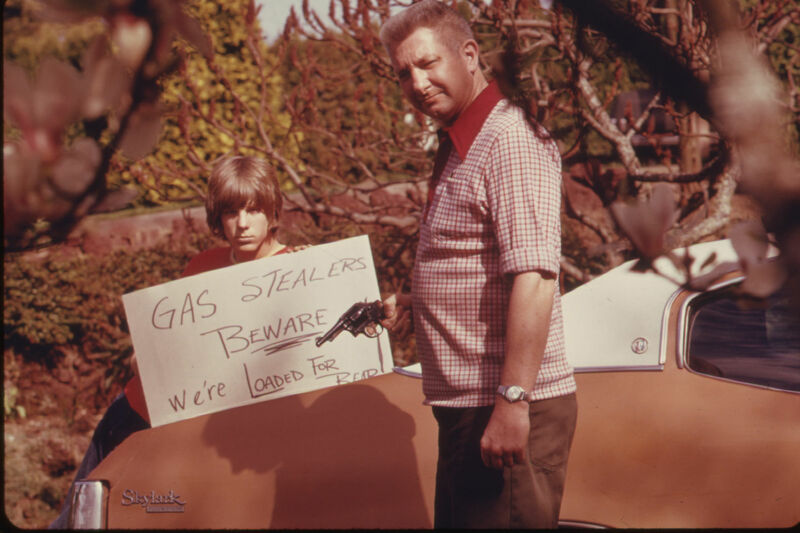 Forty years ago, Oregon got a peak-oil preview. October 1973: During the Yom Kippur War, oil-exporting Arab countries proclaimed an embargo against Israeli allies like the US. Nationally, oil prices skyrocketed from $3 per barrel to $12, and gas stations began running short of fuel. In Portland, traffic on local freeways dropped by 20 percent. Gov. Tom McCall soon asked filling stations statewide to implement a rationing system: cars with license plates ending in odd numbers could fill up on certain days; the next day, even-numbered cars got their turn. Two years earlier, the Environmental Protection Agency began dispatching photographers across the country as part of its Documerica project. David Falconer’s shots of Oregonians coping—or not coping—with the oil shock simultaneously preserve vanished hairstyles and car models and capture an unease about natural resources that has never really gone away.